When the Government announces its next GDP figures, for the third quarter of 2014, they will for the first time include calculations for the economic activity of prostitutes and drug-dealers. These activities supposedly add up to £10 billion a year (though the statisticians admit this is more or less guesswork). Nevertheless, adjustments for drugs and prostitution together with some other changes will add something like £30 billion to Britain’s GDP. The inclusion of illegal activities in the way we calculate GDP was insisted on by the European Union’s statisticians on the grounds that some countries add them in and others don’t so we should compare like with like. But there is another good reason why the EU wants to boost the GDP figures of its member states and it’s not simply to make the Eurozone wasteland look a little healthier than it really is. It’s because if a country’s GDP rises, so does its financial contribution to Brussels, because every nation’s contribution is partly based on its economic output. Earlier this year, it was announced that reasonable economic growth in the UK would add £800 million to the £8.1 billion we already hand over to the EU. Now, thanks to prostitution and drug-dealing, we face having to hand over yet more (even though the State does not tax, and therefore does not derive any financial benefit from, these transactions and does, in theory at least, try to limit them given that they are against the law). Our statisticians have decided the illegal drugs industry is worth £4.4 billion a year. In addition, even though they more or less admit they haven’t got a clue, they say the country has 60,879 prostitutes raking in £5.3 billion with 25 clients a week paying an average of £67.16. By their calculations it means the average lady of the night is on £87,000 a year which sounds a little difficult to believe. Anyway, Britain contributes 0.74 per cent of GDP to the EU. As a result of including prostitution and drug-dealing in the GDP figures, we will have to find another £74 million to give Brussels. Taking into account the other changes as well, our total bill rises by an extra £222 million. Surely there is a scandal here which has not yet been fully appreciated. The EU will be living off immoral earnings to the tune of £74 million a year of taxpayers’ money. Interestingly, France is refusing to do as it’s told and has said it will not revise its statistical analysis of economic activity to take into account these activities. Dodgy statistics dog the Scottish independence debate. How will an independent nation survive without North Sea oil revenue if the wells run dry? Can it survive financially even with the oil money? I’ve had a look at some of the figures and all I can say is it’s no wonder the politicians on either side of the great divide can’t agree on anything. For instance, HMRC has tried to split up its revenue by country. On the basis of HMRC’s sums, Scotland delivered tax receipts of £42 billion in 2012-13, nine per cent of all UK tax revenues, if you include North Sea oil revenue (£37.8 billion, or 8.2 per cent, if you don’t). But the BBC says Scottish revenue was £53 billion in the same year. Curiously or not, this is the sum the Scottish Government also says the country raised in the same financial year. There is, therefore, a huge gap between the supposed income from taxes in Scotland claimed by its Government and the sum claimed by HMRC. SNP leader Alex Salmond says Scotland generated tax revenues, in 2012-13, £800 higher per head than the UK as a whole. ‘For every one of the last 33 years, tax receipts have been higher in Scotland than the UK,’ he said. That’s questionable. What is less debatable is that Scotland’s public sector spends more than the rest of the UK per head. Again the figures vary wildly but one version puts the figures at £10,125 per head in Scotland compared with £8,788 in England. Another has it at £12,300 for Scotland, £11,000 for the UK as a whole. The UK Treasury says Scotland gets 14-16 per cent of Government spending; the Scottish Government puts it at 10-12 per cent. What is less in dispute is that Scotland spent £65.2 billion in 2012-13. That’s a deficit of £12.1 billion (or considerably more depending on where you start from). Still, the UK is overspending too, so what does it matter? Well, Scotland’s deficit, even if you give the Scots all the oil money, represents 9.3 per cent of the UK national debt. Yet its population is only 8.3 per cent of the population. That means the country is earning less and spending more than the nation as a whole. The UK overspent in 2012-13 by £2,031 per head; Scotland overspent by £2,285 per head. It’s not a yawning chasm but it means Scotland is about 12 per cent more profligate than the UK as a whole even if you hand the country all the oil revenue. If the oil dries up, it will have to borrow more money to balance the books – or it will have to impose the sort of spending cuts Mr Salmond rules out at every opportunity. The Treasury’s Office for Budgetary Responsibility reckons North Sea oil revenue will fall from £5.581 billion in 2012-13 to between £3.6 billion and £3.2 billion over the next few years to 2019. Luckily the Scottish Government has the answer. The Scottish Government has decided its oil revenues won’t decline at all, or only by a small amount. Its statistics claim oil money will come in at between £4.8 billion (a fall of £900 million) and £8 billion (an increase of £2.5 billion). Of course if we could predict future oil prices we’d all be millionaires. But as the Scots seem interested only in short-term pain or gain, it’s a pity, if not an impending national tragedy, that the numbers vary so wildly. It is no wonder the two sides of the independence argument can’t agree on anything. I’m still exercised by the £375 billion the Bank of England conjured out of thin air, called quantitative easing, and used allegedly to prop up our ailing economy after the crash of 2007-8. This money was supposed to go to British businesses to encourage investment in new ventures. It hasn’t done that. So what has happened to it? Some went to prop up the balance sheets of our appalling banks, whose bosses should not enjoy multi-million pound bonuses and pay-offs but should instead be in jail. That may explain away the whole lot. But here’s another answer. A lot of it has gone to blow up a housing bubble which is still inflating. This is Chancellor George Osborne’s master-plan for winning the next General Election. All home-buyers (mostly Tory voters, after all) like rising house prices. We can sell at a profit, we can borrow against our rising equity, we love all this unearned wealth sloshing around us, especially if we live in London. What’s not to like? Well, apart from the fact that every bubble bursts eventually. And rising prices mean young people are condemned to rent for years to come unless they have rich mummies and daddies. And it creates a totally artificial impression of the true state of the economy. While we are certainly better off than our Eurozone neighbours, manufacturing is now in decline again and exports are stalled – mainly because of the recession in said Eurozone. They will be dumping goods here while we can’t sell anything across the English Channel because no-one apart from the Germans has any money. QE has been squandered on house price rises because, as houses are classed as assets, they do not count towards the rate of inflation. That means they can inflate away at 25 per cent a year and officially, according to the august experts at the Bank of England, the rate of inflation remains unchanged (apart from some small adjustments). This is why we had rampant house price inflation, ridiculous lending decisions and low interest rates before the crash. And why they have come back to haunt us, fuelled by the Bank’s artificial, made-up, fictional £375 billion of printed paper. I have reached this conclusion by looking at the figures for lending put out by the Council of Mortgage Lenders. These show that in the 12 months between July last year and this June, home loans totalled £198,149,000,000 (call it £198 billion). In the depths of the recession, mortgage lending slumped. In 2007, just before we all fell off the bank-made cliff, loans totalled £362 billion. They were as much as £253 billion the following year. By 2009 they had slumped to £143 billion and fallen to £135 billion in 2010, when the Coalition Government was first elected. Since then lending has risen every year: £141 billion in 2011, £145 billion in 2012, £176 billion in 2013. If we take £135 billion as the base line, it means lending over that figure has risen by £6 billion + £10 billion + £41 billion + (by the end of this year an estimated minimum of) £45 billion. That comes to £102 billion. At a time when financial institutions are supposedly strapped for cash, where have all these billions come from? The answer has to be QE. Of course some additional lending would have taken place anyway and it is not running at the kind of level we saw a decade ago. So you could argue this is just the natural pattern for an economic recovery. That doesn’t seem terribly likely, however. For banks and buyers, house-price rises are still seen as the safe haven and sure bet they were for such a long time before it all went horribly wrong. And it’s true things never went as horribly wrong in Britain as they did in Ireland or the United States, for instance. But rampant house-price inflation is not an acceptable way to create the illusion of economic recovery. It cannot last unless the Bank of England prints more money for mortgage-lenders to burn. If the economy were really recovering, the Bank would have increased interest rates by now. That they haven’t done so has little or nothing to do with the official rate of inflation (which itself has no relationship with reality). It’s all about creating an illusion of well-being ahead of the next General Election. If the bubble doesn’t burst and interest rates don’t rise (or even if they do by a quarter of a per cent or so), George Osborne will get the credit for rescuing the economy and the Tories might actually win the election. The truth is, as usual, that they are just deferring the evil day when the QE money runs out and house prices have to return to some sort of normality. At which point, no doubt, the Bank will invent a few more tens of billions to keep the whole tottering edifice from crashing down. 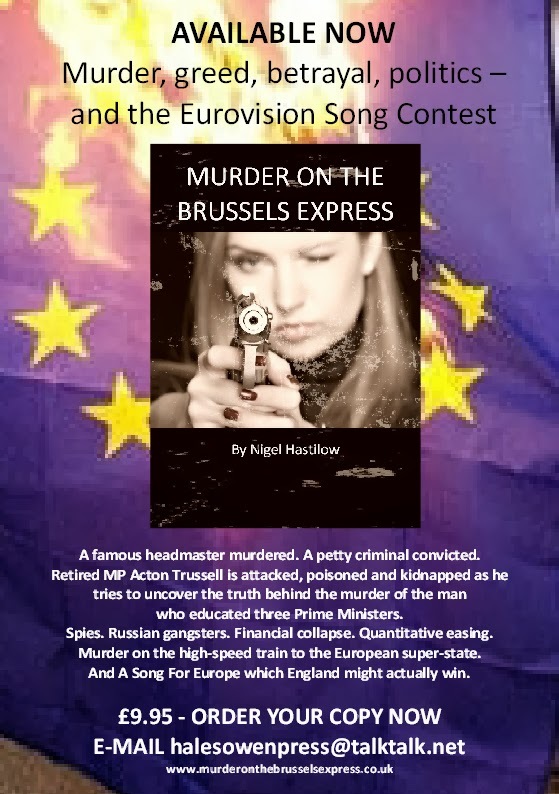 • For more on how QE might affect the country, why not check out my novel ‘Murder on the Brussels Express’ where this distinctly unsexy subject plays a significant role in the plot? The EU or The Killers? Stunning revelation of the day – the EU’s health and safety rules almost cost me my brand new MP3 player. I lost one and bought a tiny ScanDisk replacement but it was so quiet it couldn’t be heard on a train or in the car. So, greatly disappointed, I decided to junk it and see about buying something more expensive (this one cost about £35 and I decided it was my own fault for trying to get one on the cheap). In passing I read some reviews of it on Amazon and one of them announced that because of EU health and safety regulations, it was set to play so quietly as to be almost inaudible. The advice was to re-set it to North America rather than Europe. I did that and, voila, it works pretty well. Pleased though I am to have found a simple solution to the problem, I am still gobsmacked that EU rules mean the thing was set in such a way that it couldn’t actually perform the task it was designed for. There are plenty of better reasons for despising Brussels and all its works, no doubt, but as I write this listening to The Killers at a reasonable volume, I can’t think of one. The problem for the political establishment is that whenever it rubbishes UKIP or one of its candidates, Nigel Farage’s party remains more or less unaffected. It may even benefit from the attack. While the BBC and its chums queue up to accuse UKIP of racism, sexism, homophobia or whatever, the voters actually react not against the party but against its critics. The ‘thoughcrime’ accusations are calculated to encourage people to say ‘to hell with it, these UKIP people are only saying what plenty of us think privately but are forced to suppress’. A vote for UKIT has therefore been turned into a vote against politically-correct thoughcrime. Voters are fed up of being told what they may and may not think and say. So a vote for UKIP becomes a vote for freedom of speech. Of course, that freedom will be portrayed by the serried ranks of the political establishment as the freedom to be racist, homophobic or sexist and therefore described as unacceptable. But most people don’t like being told what to do. We still, mistakenly in many ways, think of this as a free country. We may modify our views over a period of time but we don’t take kindly to being ordered to think and speak in certain ways. So we rather like the idea that a political party can champion a politically-incorrect outlook – even when we don’t agree with what an individual may have said. Discussion and debate are fine; people shouldn’t be shouted down and silenced simply for expressing an opinion which may be regarded these days as outlandish but which was received wisdom only a generation ago. None of this has much to do with the European Union or with UKIP’s policies. It’s a revolt against the dictatorship of the establishment. It’s sticking up two fingers up at Big Brother. And it serves him right. Which is the more truly democratic - the European Union or the Eurovision Song Contest? I’ve just had an email from David Cameron, along with trillions of others who haven’t managed to ditch his spam, insisting the Tories are the only party we can trust to deliver a referendum on the EU. He has, not unreasonably, taken advantage of Ed Miliband’s announcement that a referendum would be unlikely under a Labour Government. Miliband's decision is disappointing and somewhat perverse. But now, with the Lib Dems led by a fully paid-up Citizen of Europe, you might think Dave’s pledge might be of some importance. But after reneging on his ‘cast iron’ promise to hold a referendum following the signing away of more sovereignty in the Lisbon Treaty, surely any pledge has to be worthless. He has seen the Referendum Bill thrown out in the Lords and shows no sign of trying to give it another chance. And anyway he decided to leave it to a backbench MP to push through rather than giving it the impetus of Government. He has no idea of what ‘renegotiation’ he might achieve before putting it to a referendum (incidentally if there ever were a plebiscite we know with absolute certainty that he and his party would combine with Labour and the Lib-Dems to skew the question and campaign to keep Britain in Europe). Cameron has also rejected the chance to hold a referendum before 2017 . There is no good reason why it couldn’t be held this year but the few brave souls in the Tory party who suggested it were comprehensively rubbished by their own colleagues. The odds are slowly and deliberately being stacked against anyone who might campaign for withdrawal from the EU. But the chances of ever getting one are minimal. There is only one party which could demolish this cosy consensus and force a referendum on the Europhile triumvirate taking it in turns to run this country under orders from Brussels and that’s UKIP. Nigel Farage’s party may have its drawbacks – more than a few loose cannons, little money and even less organisation – but only UKIP would deliver a referendum. The Conservatives have been a massive disappointment. Even William Hague seems to have gone native since his elevation to the Foreign Office. You can argue about electoral tactics. A vote for UKIP may, in some places, be a vote for Labour. But that doesn’t matter any more because a Miliband Government will be scarcely any different from a Cameron-Clegg one anyway; certainly not in relation to the EU and that means in relation to everything from purchase taxes (VAT) to prisoners' rights. Cameron is Blair by other means (only Gordon Brown, let’s not forget, stood between us and the Euro). But an overwhelming vote against the tripartite status quo would force at least two of the losers – Labour and Conservatives – into a reappraisal of their Europhile policies. I still think UKIP should not fight every Westminster seat. It should enter into a constituency-by-constituency non-aggression pact with those MPs, whatever their colour, who pledge to support a referendum at the earliest possible date. Complete withdrawal from the EU may be the aim but the first step is to secure a referendum. The bigger the UKIP vote – at Euro elections and at the General Election – the greater the pressure there will be on mainstream politicians to offer us a chance to escape the evil empire. You kip if you want to; UKIP's not for turning. The evil empire of the European Union is creating a confrontation with Russia over the Ukraine. Step back and look at it from an historical perspective and you will see this is just another stage in the endless conflict between Germany and France on the one hand and Russia on the other. Napoleon and Hitler tried to conquer Russia with force. Now their natural successor, the EU, is trying to do the same with economic power and crowd-pleasing diplomacy. The Ukraine has never really been an independent, self-governing state and it does represent Russia’s bulwark against aggression from Western Europe. No wonder it is suspicious of the EU’s intentions. The protestors in the Ukraine are being used as pawns in an historic power-struggle. The EU is adopting its traditional approach to the struggle with the Russian bear, rattling its sanctions sabre and marshalling the big battalions of self-righteous “democracy”. As if the EU knew anything about democracy and the will of the people - just look at Italy which has just installed its third unelected Prime Minister since Brussels decided trampling on the rights of the citizens was justifiable if it meant saving the Euro. The EU should avoid any further involvement in Ukraine’s internal difficulties and give its people no cause to believe they would be happier or better off run from Brussels instead of Moscow. It’s hard to imagine that 100 years on we could be heading for the kind of confrontation we thought had gone out of fashion after the demise of Kaiser Bill and the Tsar. · As the people of Sunthorpe pointed out on Question Time, how come nobody noticed the floods until they affected the Home Counties? · Why is it only now that £5,000 repair grants have been made available? What’s so special about the Home Counties? Why not offer grants to everyone who has been flooded in the past 100 years? · Why are sandbags considered a solution? They are more or less useless under all circumstances. · Why are there more cuts on the way for the Environment Agency and why is Chris Smith still in charge of it? · And when things dry out a bit will all these promises about spending “whatever it takes” be forgotten – just as they were when we were flooded in 2007? This has been a tough week for Britain. The wettest winter in two and a half centuries, some of the worst flooding in decades, and more severe weather on the way this weekend. We will do what is necessary to help families and communities get through this very difficult time - more information is available on the Environment Agency website if you are affected. We will also help people rebuild their lives and get back on their feet after the flooding, with repair grants of up to £5,000 for homeowners and businesses affected by the floods, and further support for businesses and farms that have suffered. Amidst all of this, as is so often the case, in the toughest of times we are seeing the best of Britain. Visiting the affected areas this week, I saw the incredible hard work and dedication of our emergency services, the Environment Agency, local authority workers, councils and armed forces. I also saw the most inspiring community spirit amongst the many volunteers who are rolling up their sleeves and helping out those in need. Everyone involved in the relief effort deserves our heartfelt thanks. Please join me by leaving a message of support on Facebook. It will take time, but together we will deal with these floods, get our country back on its feet and build a more resilient country for the future. Please take a minute to say thanks to everyone who is working so hard to make that happen. In 2007 the Environment Agency pledged swift action to reduce the risk of further flood damage in the area of Broadway, Worcestershire, after that summer’s inundation. They even held a road show and made glorious promises of all the money and effort they would be putting into their scheme.Seven years later, they have done next to nothing. Their website promises a scheme in March this year. That, we can reasonably assume, will bring further consultations and risk assessments about the potential damage to local flora and fauna. The EA couldn’t even drain bathwater safely. So I am not surprised people in Somerset and elsewhere are beside themselves with fury at the agency’s ineptitude. PS Since writing this I have looked at various EA reports on flood alleviation in this area. The good news is that several 'tailored ecology surveys' have been carried out into the habitat for otters, water voles and white-clawed crayfish. And even better is the news that 'an amphibian survey is also being carried out to identify the presence of great crested newts'. The bad news is that the money earmarked actually to carry out a flood alleviation scheme in the area has now disappeared, dried up, gone down the plug-hole and otherwise evaporated. Unlike the water. As Britain prepares for this year’s Euro-elections, a new novel looks into the murky, secret origins of the European super-state. With its origins in the chaos of Europe after the Second World War, the EU’s founding fathers were determined such devastation must never happen again. But when it came to propaganda and brainwashing, did they learn from the Nazis? Ex-MP Acton Trussell investigates the apparently straightforward murder of the country’s most famous headmasters. It quickly becomes clear the murder was not the result of a burglary-gone-wrong. who was responsible for the education of no fewer than three Prime Ministers, he discovers more than he bargained for. The story follows Trussell’s investigations to London, Brussels, Amsterdam, Paris and – finally – to Avignon. He is only kept alive by the good offices of a “friend” but even then his life is increasingly in danger as he stumbles on a conspiracy to destroy the Bank of England, rob Britain of its independence and hand the profits to Russian gangsters. Meanwhile his daughter is trying to win the Eurovision Song Contest for England. Author Nigel Hastilow says: ‘With elections to the European Parliament taking place in 2014, it is worth asking ourselves how the powers-that-be managed to create what is now more or less a single super-state. ‘It may have developed by accident but the more you consider the EU’s slow, determined and inexorable progress towards “ever-closer union”, the more likely it seems we have allowed a super-state to be created by stealth. ‘Is it possible that a group of determined people, with the single goal of accumulating most of Europe’s power and wealth, could really have succeeded where tanks and bombs failed? ‘This novel considers these possibilities as its hero, Acton Trussell, tries to prove the innocence of a man convicted of murder. Murder on the Brussels Express is available in paperback edition (£9.95) from Halesowen Press, or Kindle edition (£5.00) on www.amazon.com.